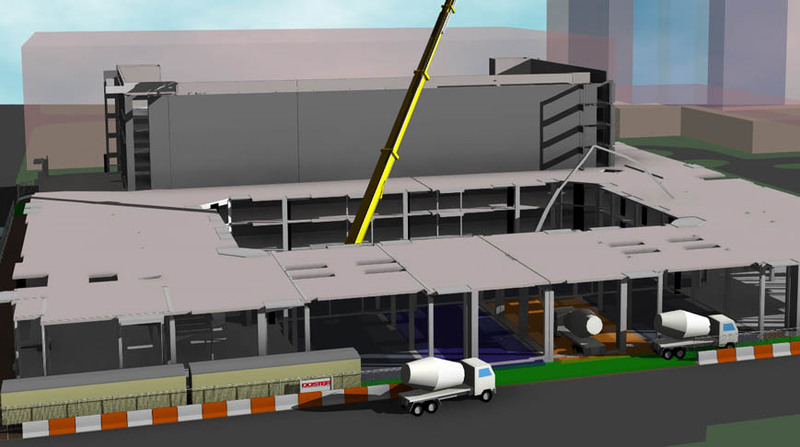 The BIM Team can produce a phased site logistics plan from an existing model or drawings. The model shown below was provided to Doster by the Design Team. Doster’s BIM Group then worked with a Project Manager to determine the site logistics and produced the model based on the Project Mangement Team’s Plan. The first image shows the empty site with basic masses of the surrounding buildings for context. The image communicated the first major stage of the project: installing site utilities that run underneath the future parking garage to get the critical path parking deck underway as soon as possible. The second image shows site mobilization, material laydown (grey), and crane/equipment paths (orange and blue) in and out of the center of the apartment complex. The site was very small, so the job offices were squeezed to the edge of the site and jersey barriers placed near the heavy traffic areas. The site fence is shown and the green areas represent the crane and equipment paths. The third image shows shows the erection of the parking garage and the direction in which the deck is being erected. The apartment structure is to be constructed clockwise starting a the far end of the parking garage. The cranes and concrete trucks are shown in the center of the apartment complex. The fourth image shows the completion of the parking deck as the apartment structure completes its first floor clockwise rotation around the site. The fifth image shows completion of the aparment structure and the skin of the apartment complex being constructed clockwise around the site. A buckhoist is shown on the right corner of the building to allow material to be hoisted to each floor for fit out. The sixth image shows the copmletion of the exterio skin with the center remaining open for continued equipment access and construction of the center courtyard. The cranes have been demobilized. The seventh image shows the opening in the center closed while the final fitout continues inside the building. The eighth image shows the demobilization of the site, the final hardscape construction, and a completed project.